This encouragement card was designed to offer empathy to someone who has suffered the loss of a spouse, parent, child or friend and will be having an anniversary or special date that will bring them additional sadness. This card can be fully customized and personalized at no extra charge and also includes a free matching colored envelope, round envelope seal, and a U.S. Forever postage stamp. 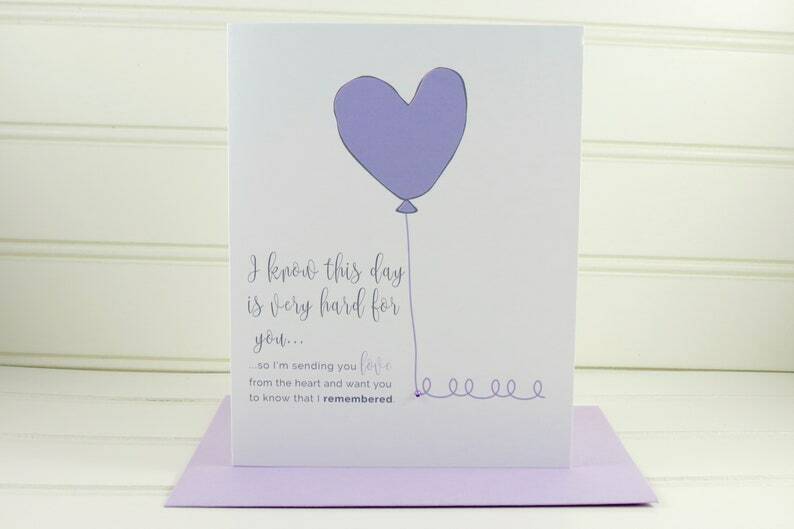 This personalized card has an illustration of a pretty lavender balloon and the message, "I know this day is very hard for you...so I'm sending you love from the heart and want you to know that I remembered". The card is blank on the inside and measures 4.25” x 5.5”. I am very pleased with the beautiful card and even more impressed at how the owner handled an error I caused in my order. Thanks for making it an easy fix!